I've fixed my computer and recoverd the lost years of wall paintings! thank goodness. I really thought i'd fudged that one. To celerbrate my renewed interest in that side of my work i packed my telescopic ladder and my paints and painted the wall below. 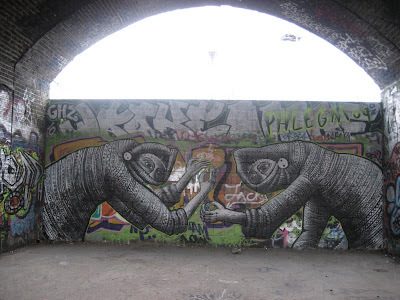 It's under a railway arch in mile end, London. I had to stop for an hour because of a blizzard. Knarly. Excuse the bad photo, my hands where cold and i really wanted a cup of coffee by that stage.